Awesome! She is my fave heroine too! And yes, Zen will have a route! Hey, guess who plans to finally play this demo after so long. Anticipate. Opinions sometime this weekend. Hey how is the progress? Progress is a bit slow because our editor and myself have a new day job, but more updates can be seen in my twitter @azureXtwilight! The characters are intersting and good looking but... Ash could look more feminine and... atractive. And plot and the lore seems to be intersting. Heya! Thanks for liking the op! I feel like the point of Ash being masculine goes over a few people’s heads. Like you can actually mistake her for a guy because of her handsome looks, and that’s the point of why it’s mentioned in-game. If she looked very feminine and people kept calling her a guy it would be weird! (like how it happens in a lot of manga). Sorry, but Ash looks really attractive enough for me! So I am keeping her design =) And we don't have enough funds to hire a professional artist, but maybe you can donate and I'll see if we have enough fund! So I'm confused. Who am I playing as? and are they a boy or girl? Dr. AzureXTwilight, can you please put up your other earlier games from this Fantasia series onto itch.io?? I honestly loved the story line and that there were many options for actions. However, the art for the characters do not match the background at all so it was a little off putting. And the character art could use a little work but it's still very cute. The shading and colors are really well done so adding a tad more detail and fixing the small amount of proportion issues would really make this stand out and I know this would be even more of a gorgeous game. Also as an artist myself, I have a small tip, look into Design Doll. It'll make figuring out poses easier and help you keep proportions! I look forward to playing the rest of the game. Keep up the great work. Thanks for the feedback, will definitely check Design Doll out! I purchased the backgrounds because I can't do backgrounds for life, though. So I am afraid we'll have to stick with it until the completion! Not a problem! That's quite alright. The backgrounds are very pretty it was just more of an observation that they didn't match and after re-reading the post, I noticed it was drawn by a different artist. Sorry about that. so im confused, who do we play as? Are we Ash or Fatima? Definitely Ash XD She's the one with the little portrait at the textbox, and the one called "you" by the narrator. I was afraid that you are dead >*< Thanks good that is not true! I love your Fanstasia series they were my very first otomes! Something totally different from old demo u-u Looking nice I am gonna play it and give u feedback. Am waiting eagerly for your feedback! Okay, I was so fanscinated by demo! And I thought that Ash is a boy, oh god XD Plot so far looks really interesting I am curious about other endings that you have in mind hehe and relationships development. I think my type wil be Zen, I like his a little goofy character ~~ Art is very nice, so much improvement since your previous games! I am AMAZED! I also liked this funny options about telling the real Ash job hehehe. Nothing just wanna say hi. I loved a lot of the choices given as well. One of them took me by surprise, but it had me laughing. Was not expecting it at all. Can't wait to see where you take this! I love the second POV since there are so many choices you can be provided by as a main character and the narrator is self-aware, so prepare for more absurd choices! First of all, I’m really happy to see a continuation of the series. I love the setting just as much as I did in the first two games when they came out years ago and seeing another game being announced for the Fantasia series made me really nostalgic but also really happy! 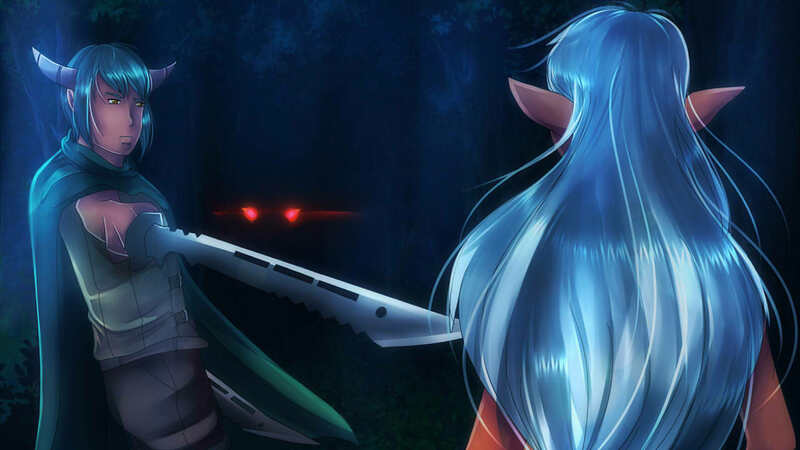 I think Fantasia ROT has been one of the first VNs for quite a lot of people, so for us who remember the game from back in the days it’s definitely exciting! Second of all, I absolutely loved the characters. Ash in particular is such a good one! I love her from all possible points of view, since I personally really enjoy strong and manly females and she is pretty much one of a kind. While I have in mind a few characters when I think of a strong woman, I can’t compare her to any of them. She’s just... very naturally unfeminine. As for the others, I think that Fatima is a really sweet girl! I felt bad for having to do my job in some of the endings because she’s so pure. Altair cracked me up by being so done with everyone and Malik was also amusing with all his perverted comments. I am a little suspicious of him though as his reaction to some of the endings are... questionable. Zen’s my personal favorite until now! He’s such a cute puppy-like demon, though a smart one for sure. I kept talking to him instead of the others because I wanted to know more and he’s definitely the first route I’ll do once the game gets released. Thirdly, I absolutely love how varied the choices are! I 100% did not expect some of the options to take the turn they did, since in most games they go along the line “You might want to do that, but we’re still going to stop you from doing it”. The demo ending where all of them remain together was also extremely funny. I can’t wait to do Fatima’s path and “run towards the sunset” because it’s definitely going to be good because of how opposite the two girls are! The OST is also very pleasant, which is something I also remember from the previous games. There’s not a lot of VNs in which I could enjoy the music as much (and not turn it off for)! The art is good as always, though I have constantly seen your works so it was to be expected! The BGs are very fitting for the story, without being too tiring on the eyes, and the entire menu is very nicely designed! Looking forward to play the final version! And yes! Your starting party member all will have routes where you can definitely romance them! Including Fatima ;D hence the yuri option! Yesss thank you for the proofreading!